Meet Sixteen Year Old Yui Mizuhara! I'm not too keen on sports games, but this one is a bit unusual. 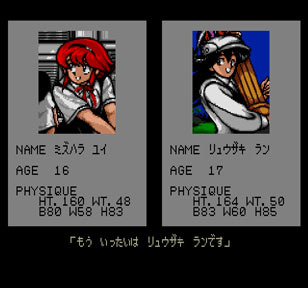 It just so happens to be golf with an anime story! 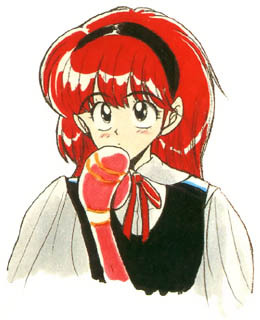 You are Yui Mizuhara (Code Name: Black Fire), a sixteen year old "Battle Golfer" who must go against the odds and eventually play against Professor "G". 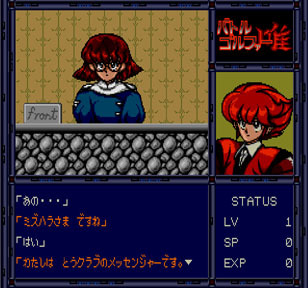 Professor G is the leader behind "Dark Hazard" and you will encounter others such as Kaoru Hagata, "D" Bot, Kitako, and Ran Ryuuzaki (Yui's rival). Yui will also meet a clone of herself, though the clone's measurements are wrong and the clone has bigger breasts! I found that to be pretty hilarious and a bit unexpected, so it's pretty cool. 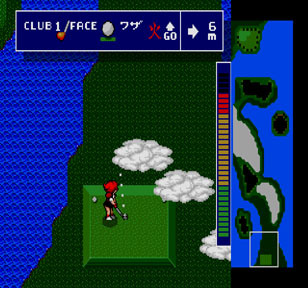 In the adventure mode, you will play several rounds of golf. Along the way, you can watch the basic plot unfold and win the tournament. While the game is a golf game, it also plays out like an early mystery game and you must talk to the various people in the area to unravel clues and other such things. 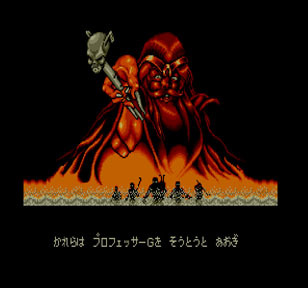 From my understanding, there is a good and bad ending, and you must make several decisions during the course of adventure mode. The graphics are pretty decent for early 1991...as far as golf is concerned. Water moves, lava bubbles, clouds float by...all that good stuff. 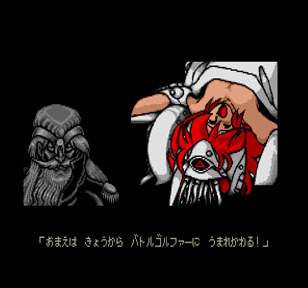 There are also a couple of neat anime scenes (D. Bot is kinda funny) to look at, so that certainly helps move things along. The music is fair. It's not bad, but it could have been better. With that being said, there are a couple of nice tunes mixed in and the rest passes. Sound effects work, but they aren't too great. When the person (I'm thinking its your female caddy friend, but can't verify) says "Nice Shot! ", you can distinguish the words, but it could have been better even still. 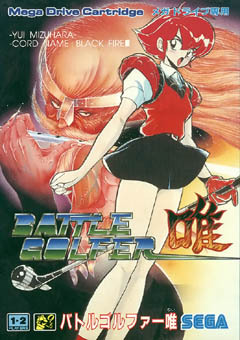 The gameplay is mostly like an ordinary game of golf. There is a two player mode and an adventure mode (Story Mode) that you can choose. You gain levels and SP (SP is required to do "Waza" or techniques) as well as experience points. As you progress through the story, you will learn different techniques. You can tell the wind direction based on which way the clouds are moving and you use different clubs depending on the situation. Your caddy will give you the club she thinks is best for the current situation, but you can change the club if you want to. You can also choose where you want to hit the ball when you swing and a power gauge indicates the force you are going to have when you hit the ball. The higher the gauge, the stronger the swing. Compared to some other golf games I have played, I feel the real-to-life physics of golf are a little loose in this game. The wazas also require some tweaking. Every time I use the waza that has the left or right arrow and I hit the ball, the ball always seems to go overboard. There are plenty of obstacles to get in your way too. Still, the game has some neat wazas like the forward arrow waza, and the bounce on water waza. With a little practice, the game can still be fun. It's a little unusual, but for its time, it's a fairly solid game.